Having set out as goals changing mindsets and restructuring the organization to get SEGA back on a growth track, I made an all-out effort to reach these goals during the year. In these efforts, we focused on stepping up the pace of decision-making. As well as delegating significant authority to directors, we spun off the main capabilities of our network business to establish SEGA Networks, Ltd., in July 2012. We also spun off the amusement center business to establish SEGA ENTERTAINMENT Co., Ltd., in October of the same year. Through this restructuring, we have significantly speeded up directors' implementation of strategies in each business area. In addition, rapid decision-making has become firmly established. In particular, we are able to make decisions to abandon products with low potential quickly and shift development resources to more promising products. And, for example, we can reach decisions promptly on postponing releases to heighten their chance of success from a medium-term viewpoint. Formerly, SEGA did not have this kind of mindset that emphasized steady medium-term returns over short-term results. Since The King of Beetles "MUSHIKING" kids' card game, which we began installing in 2003, became a blockbuster, SEGA has not had any major hit products. For five or six years, the company has been focusing on reforming its cost structure. At the moment, I have a sense of crisis because I think the company is nearing a tipping point that will determine whether it survives. Therefore, I am determined to do whatever it takes to revitalize SEGA and realize operating income of ¥20 billion in the medium term. I do not think the road to achieving this target will be smooth. Nevertheless, while overcoming problems one at a time, based on a medium-term outlook, I intend to rigorously strengthen the businesses in our portfolio that we should grow. Clearly, one of the businesses we should strengthen is the digital game content business. At present, the digital game content market is becoming increasingly homogeneous, making differentiation more difficult. On the other hand, the preferences of jaded players and the advances in devices' functions are fueling demand for rich content. Consequently, I think the market is probably on the brink of its next development phase. 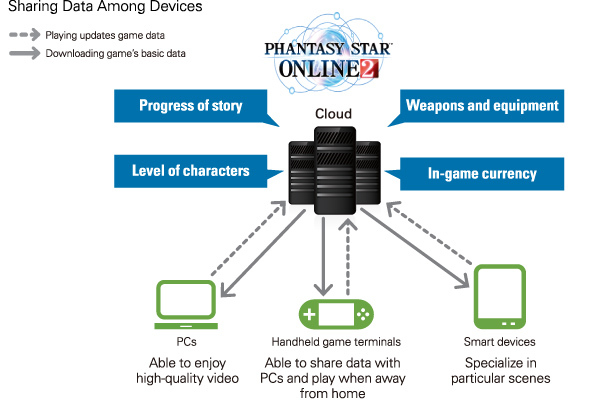 The PC online game Phantasy Star Online 2, a title for which SEGA pulled out all the stops, took five years to develop. Normally, companies would launch a title they have spent this much time and money developing as packaged game software. However, our decision to break with convention and release it as a free-to-play (F2P)¹ game reflected demand in a market undergoing transformation and led to the game's success. We plan to leverage this kind of content as the basis upon which to mount further business strategies. Phantasy Star Online 2 features SEGA's signature rich content; a rivetingly complex and multilayered story; and a range of innovations that allow players to use it with peace of mind. In addition, we will advance a cross-platform strategy whereby the sharing of cloud data enables players to enjoy games through a variety of platforms. As the first step in this strategy, we rolled out Phantasy Star Online 2 for PCs with the Windows operating system and handheld game terminals. Moreover, this year we plan to launch a version for smart devices. We will optimize the video game's content for smartphones and enable players to develop characters. Furthermore, we want to use the expertise garnered from this successful example to roll out other intellectual properties and multiply earnings. Also, we will roll out content that has succeeded in Japan in overseas markets. In particular, we intend to further develop the whole of Asia as a single market. As for packaged game software in North America and Europe, plans call for shifting our lineup of mainstay intellectual properties online to add further value to them. In the PC online game area, we acquired North American game developer Relic Entertainment Inc., and intellectual properties related to titles under development in January 2013. This company owns Company of Heroes, a global real-time strategy (RTS)² title that is particularly popular in the North American and European markets. Added to the market share of the Group company The Creative Assembly Ltd., this new company has given SEGA more than half of the RTS market. By realizing synergies between the two companies, we intend to develop stable earnings foundations. The key to achieving operating income of ¥20 billion is SEGA Networks. In fiscal 2014, we plan to launch a series of differentiated titles that we are confident in. Released in April 2013, Puyo Puyo!! Quest has given us a glimpse of what is to come by outperforming all expectations to reach 1 million downloads during the first 10 days following its launch. However, we have just hit our stride. Regarding packaged game software, although market conditions are tough, we have no intention of shrinking business. That said, we will not use a traditional business model that only sells products with predetermined features. Instead, we will add value by catering to current requirements through the inclusion of online functions, downloadable content, and social features. In this way, I want to continue taking on the challenge of sowing the seeds for future growth. 1 These are games based on a business model where basic play is free, but fees are charged for additional items within the games. Unless the amusement center market expands, sales of amusement arcade machines will not grow and vice versa. With this in mind, we will take on the challenge of building business models that generate earnings for amusement center operators. Inevitably, support is waning among players for the business model based on a few minutes of play for ¥100. In response, SEGA has undertaken the trial introduction of Puyopuyo!! Quest Arcade. This title features a new business model designed to lower the entry level by adopting a free-to-play format, widen our player base by incorporating broadly popular intellectual properties, and stabilize earnings through continuous fees. 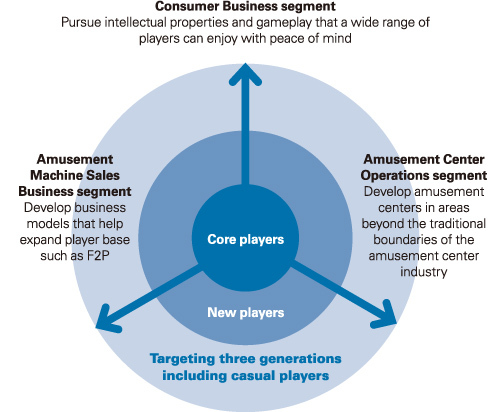 I want to create innovative schemes that heighten linkage to attract players from smart devices to amusement centers as well as from amusement centers to applications and thereby expand our player base. As it continues to pursue a scrap and build policy, the Amusement Center Operations segment will expand beyond the traditional boundaries of the amusement center industry into new areas. In these efforts, our goal is to provide entertainment that grandparents, parents, and children can enjoy. To give one example, in August 2013 we cut the tape on Orbi Yokohama, a joint project with BBC Worldwide Limited. Three generations can enjoy this simulation museum, which takes advantage of the BBC's abundant intellectual properties. If it proves successful, we plan to license it out overseas. Also, our development of amusement centers will go beyond the traditional business format by proactively incorporating amusement centers into shopping centers, restaurants, and other facilities.